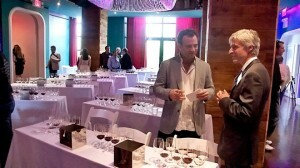 NEW YORK – June 13, 2011 marked the first-ever grand portfolio tasting of Croatian wines, which took place at Hudson Terrace in New York City. Cliff Rames, founder of Wines of Croatia, an organization that promotes the wines and lifestyle of Croatia, led an educational winemaker seminar. A tasting on the terrace followed, featuring Croatia’s signature native varieties including Malvazija, Pošip, Teran, Plavac Mali, Graševina and Žlahtina. Croatia offers mostly small-production, handcrafted boutique wines. There are 17,000 registered vine growers, and 33,000 hectares of vineyard surface area. Every year, Croatia produces 65 million liters of wine. “Wine growing and wine drinking is an inherent part of the Croatian culture, lifestyle and tradition,” Rames said. When Croatia became part of Yugoslavia, winemakers were required to sell their grapes to big cooperatives, which created a focus on quantity rather than quality. Now, with a new generation of winemakers, Croatia is turning the page to a new chapter of Croatian winemaking. Guests had an opportunity to meet some of the producers and distributors of Croatian wine on a grand terrace overlooking the Hudson River. Among importers who represent Croatian producers were Blue Danube Wine Company, Tasty Wine Company, Vinum USA, Oenocentric, Katharine’s Garden, Empty Glass Wine Company, and Dalmata. The full list of wineries represented: Agrokor vina, Bibich, Bodren, Cattunar, Coronica, Degrassi, Enjingi, Grgich, Ivan Katunar, Karaman, Katunar vinarija, Korta Katarina, Kozlović, Krajančić, Krauthaker, Matošević, Miloš, Bura-Mokalo, Nada, Pavlomir, Piližota, Piquentum, PZ Čara, PZ Dingač, PZ Gospoja, PZ Putnikovic, PZ Svirče, PZ Vrbnik, Roxanich, Saints Hills, Šipun, Tomić, Trapan, Zlatan Otok i Žlahtina Union. beef sliders from “Hudson Terrace”. One could almost feel the passion and inspiration crackle through the space as people milled about and sampled Croatian gastronomic treasures. Joseph Campanale, a sommelier at “L’Artusi“, made an inspiring comment that stuck with me: “Croatia has the potential to be a world-class winery.” Although Croatia will never compete with huge wine producing countries, its unique wine will surely find its niche, and will be discovered by those who seek quality and individuality.